This all seems like rock and roll. He comes on stage to the adulation of a garrulous and frenzied crowd, delivers a "teasing" performance, soaks the applause, and then works his way into the crowd for pats on the back and a lot more adoration. "I'm anxious to know when he will lose his rock star appeal," said the Barbadian pollster, Peter Wickham, of Prime Minister Roosevelt Skerrit. "It's still very much there." Wickham was referring to last Tuesday's Dominica Labour Party (DLP) meeting in Lagon, where Skerrit celebrated, and was celebrated for, his legitimacy after the Eastern Caribbean Supreme Court dismissed the opposition's appeal in the citizenship case. The Barbadian had never experienced one of these meetings before, and the experience intrigued him somewhat. "There were several fascinating thing about the meeting," Wickham told The Sun in a telephone interview. "It was like a rum shop atmosphere that they created. From my own Barbadian perspective I found that fascinating." He was touched, too, by the set-up which, to him, was "almost like a neighbor speaking out from the window…It was not really a rum shop, more like a neighbourly conversation." But in the eyes of critics, there was a naked display of drunkenness from sheer power. Skerrit's boast that he would seek revenge over "these hooligans" - a reference to the opposition United Workers Party (UWP) – and the description by one of his apostles of UWP supporter as "Al- Qaeda" who must be dealt with in the same manner that US president Barrack Obama deals with the militant Islamist organization, is a clear indication that Skerrit and those around him are both intoxicated with power and anxious, suggested Athie Martin. "The revenge statement that Skerrit made, how does a sitting prime minister make a statement that he needs the next five years, not to create jobs, not to fix the economy, but to seek revenge? He now admits that thing placed him under emotional stress and he must get his revenge," Martin told The Sun. Perhaps it was the rock star, in a state of tipsiness caused by the occasion, getting carried away. Maybe this led to grand impulsive gestures like a clean sweep in an early election. 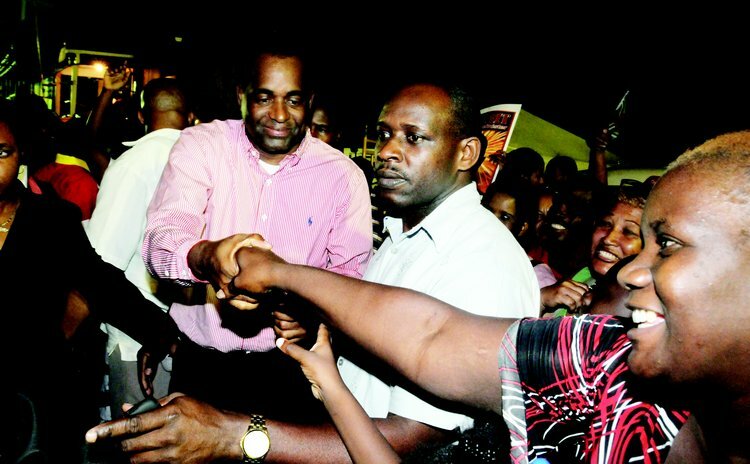 "I want you to tell all and sundry tonight that Skerrit has hinted that it won't be long," the prime minister told the adoring crowd. However, somehow, Wickham doesn't believe there will be an early election. "I think he was teasing the public to be quite honest...It was like a victory round," the pollster told The Sun. "I personally don't think so. I don't believe that he will do it." Martin, on the other hand, believes there will be an early poll, only, it won't be as early as Skerrit had been planning. The former minister of agriculture told The Sun he was convinced that the primary purpose of Tuesday's meeting was for the prime minister to name an election date had he lost the appeal. "If they hadn't prevailed he would have given a date on Tuesday night. Having prevailed they have a little bit of a wiggle room," Martin said. "It was clear they were ready for an announcement. If you take a note of the person they had chairing the meeting, (adviser to the Prime Minister, Emmanuel Nanthan), they do not pull these persons out unless they are planning something big." However, Martin believes there are two major developments that give the prime minister pause. First, he said, the turn out to Tuesday's meeting, while good, wasn't the "massive crowd they anticipated." In addition, he said, the economy was proving to be a headache for the government. "For the first he has publicly admitted that the economy has failed to produce jobs. He has shown he can created jobs for Chinese but he must show he can create jobs for Dominicans." Martin's position is supported by a DLP poll conducted by Wickham's CADRES during the last two weeks of February in 13 of the 18 constituencies held by the ruling party. It found that "Dominicans are at this time most preoccupied with the issue of unemployment." A one page release – dated 13 March – issued by Wickham gave few details on the poll. But it did say that despite the higher than normal margin of error – it did not say what the margin was - the DLP would have won an election if one had been called last month. The UWP political leader, Edison James, has said that his party will be ready whenever the polls are held and he ridiculed Skerrit's call for a clean sweep. However, Martin suggests that, unless there's reform of the electoral system, the opposition ought to boycott the elections. "If there is an election, no opposition party should participate. In this case he will get his 21." The CADRES poll also found that 64 per cent of Dominicans prefer Skerrit as prime minister, compared with 36 per cent for James. Which leads Wickham back to the subject of the rock star. "He's like a rock star," the pollster repeated. Not to Athie Martin who, with bemused toleration, suggested that this government has kicked the proletariat for much too long, and that the time is coming when the proles will kick them back. However, going by the polls, it's still rock and roll to him.